Introduction: Work-related musculoskeletal disorders are one of the main occupational health hazards affecting dental practitioners. Prolonged sitting and awkward posture can lead to work-related musculoskeletal disorders. This can result in early retirements. Therefore, ergonomic principles should be followed to establish a safe, healthy, and comfortable working environment for dental practitioners, as this also affects the quality of work. Aim: The aim of this study was to evaluate the implementation of ergonomic principles in routine dentistry. Materials and Methods: A single photograph of each practitioner while working on their patient was clicked, and a grid was then developed over these photographs. An assessment form was formulated which was used to evaluate various parameters. The parameters included eye, neck, elbow, upper back, lower back, thigh, and distance of headlight from the oral cavity. Measurements were done manually using ruler and protractor. After assessing all the parameters and determining the values, the evaluation of the results was done using Chi-square test. Results: The photographic analysis was completed by a total of 75 individuals, where 56 (74.6%) were female and 19 (25.3%) of them were male dental practitioners. None of the operators had a correct position of the neck, thus the neck being the most neglected parameter. Only three individuals were observed to follow the correct position of the elbow (P = 0.530). The majority of the individuals failed to position their back (P = 0.098) in the correct manner while performing clinical work. Moreover, it was found that only 15 individuals were following the correct thigh position while operating. Conclusion: Proper implementation of ergonomic principles and maintenance of balanced posture can prevent the occurrence of musculoskeletal disorders and thus increases the work productivity. The practice of dentistry entails expertise and skillful dental preparations with precision and great control. This requires attentiveness and patience of the operator along with physical resilience. Conducive therapeutic approach and successful practice require distinctive working conditions for the dentist and the assistant in an ergonomic ambience. Garbin et al. have defined ergonomics as a set of multidisciplinary knowledge applied to the organization of labor activities and elements that make up a job. The main motive behind following ergonomic principles is to establish a safe, healthy, and comfortable working environment for the dental practitioners, thereby preventing health problems which in turn improve productivity. The vista of ergonomics is copious and wide-ranging than just inhibiting work-related musculoskeletal disorders (WMSDs). The objective is to find appurtenant working conditions for the workers. Maintaining a proper posture provides the dentist more energy to work, reduced stress level, and increased comfort. There is a lack of pain and muscular tension and a lower risk for therapeutic errors. Bad posture is known to induce premature fatigue, pain, stress, and a negative attitude to work. It is a predominant factor for musculoskeletal disorders and poor quality of work. WMSDs are one of the primary occupational health perils affecting dentists. In everyday practice, we often observe that many dentists work in incorrect postures because of their habitude, working routine, and poorly designed workstations. It has been proposed that the injuries induced by WMSDs or similar cumulative trauma disorders can be reduced or prevented by the inculcation of ergonomics in dental gadgetry, amenities, and instrument design. Improper working stations and stance have been identified as a cause for work-induced musculoskeletal disorders. Good ergonomic practices can prevent a number of conditions such as carpal tunnel syndrome and many other disorders. It also prevents early retirements. Prolonged sitting hours, working in an awkward posture, and continuous and repetitive motions are the physical factors contributing to WMSDs. Preserving the balanced posture and its symmetry throughout the clinical act are largely conditioned by the relationship established between the dentist and the intraoral working field. In an ideal situation, the surface of the treated teeth should be parallel to the front of the dentist, and his view oriented perpendicular to the working field. 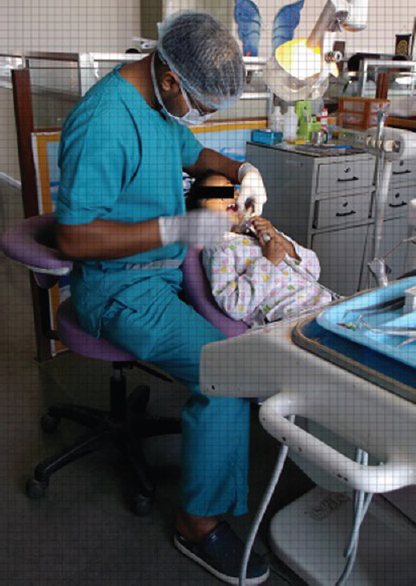 It is recommended that the distance between the working field and the dentist's eyes is of 35–40 cm or slightly higher for very tall dentists. When this relationship is not established or lost during the clinical act, the dentist's eyes will look for it, and the dentist will depart instinctively from the balanced posture. The balanced posture features can be summarized as below: a straight back and respect for the body symmetry; avoid rounding the back into “C” shape forward inclination of the trunk of a maximum of 20°; a greater forward inclination, the tilting to a side and the trunk rotation are contraindicated; forward inclination of the head up to 20°–25° from the trunk; the arms placed along the body, forward oriented within 10°; the forearms raised up to 25° from the horizontal line; the angle between the thighs and shanks of 105°–110° or more; the thighs apart up to 45°, avoiding a rigid fixation of the hip joint; the shanks oriented perpendicular to the floor or slightly posterior; and the feet on the floor oriented forward in the same plane with the shanks; when the feet are symmetrically positioned below the operator's hands, the posture is balanced. Proper implementation of these ergonomic principles and maintenance of balanced posture will avoid musculoskeletal problems in the future. Dental education for the students can play a key role by helping them to adopt and acquire adequate knowledge related to balanced posture. In this study, we have explored the posture adopted by dentists when they work beginning with the balanced posture and later adopting to different variants of posture. The balanced posture is the one that should be a reference point for the postures that are daily adopted by dentists. With the rise in the average age of retirement, it is more important to avoid musculoskeletal problems. It is essential that all the dental practitioners are aware of the importance of maintaining a balanced posture and are well versed with the steps to be taken to avoid musculoskeletal problems. To make a difference in the lives of professionals, ergonomics is not something that should be taken into consideration only during the phase of vocational training. It should be practiced in day-to-day clinical practice also. Work-rest cycles should be included in the daily routine which helps in preventing work-induced pain. The aim of this study is to evaluate the actual implementation and adoption of the balanced posture by dental practitioners. It implies the need for imparting knowledge about the ergonomic working conditions and maintaining the balanced posture to avoid musculoskeletal problems through various lectures, workshops, and continuing dental education (CDE) programs. Interns and postgraduate students of a private dental college were considered as a part of this study. Before data collection, a written consent regarding their willingness to participate in this research was obtained from the operators. In this process, 75 dental practitioners of 110 agreed to get their photographs clicked for the study. The data collection was done randomly without any prior intimation to the participants. A prior consent from the patients was obtained through a consent form before the beginning of the procedure. A single photograph of each was clicked while performing the clinical procedure without their knowledge. A point-and-shoot digital camera was used for clicking all the photographs. To standardize the procedure, certain preset norms were decided. The photographs were shot from 7 o' clock position of the chair at a distance of 6 feet from the operator. To standardize, the study photographs were clicked when the operators were working on the mandibular left quadrant as seen in [Figure 1]. All the photographs were assembled together, and a grid of 19 by 29 was developed over these photographs. An assessment form was formulated which was used to evaluate various parameters such as eye, neck, elbow, upper back, lower back, thigh, and distance of headlight from the oral cavity. Distance of headlight from the oral cavity: a straight line connecting the midpoint of the headlight and the oral cavity of the patient was constructed. The number of boxes falling on this line was counted, and subsequent calculations were done to compute the value. The standard values have been summed up in [Table 1]. After assessing all the parameters and determining the values, the data were duly entered into Microsoft Excel (2007). Data were analyzed using SPSS software version 11.2 (IBM, Armonk, New York, United States), and evaluation of the results was done using Chi-square test. The level of the significance was kept at 0.05. 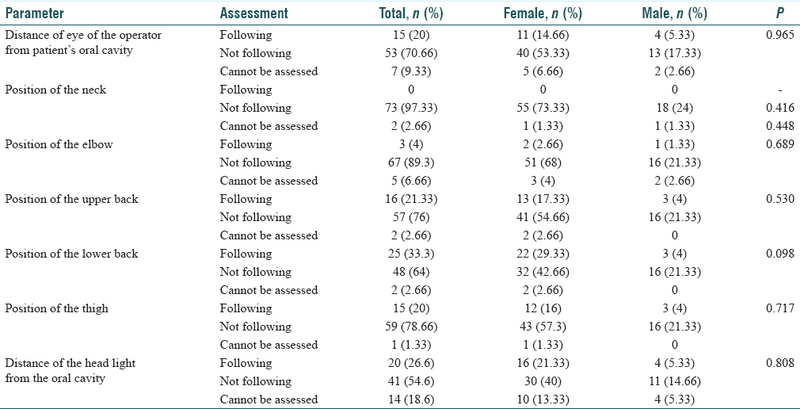 The photographic analysis was completed by a total of 75 individuals, where 56 (74.6%) were female, and 19 (25.3%) of them were male dental practitioners. The dental operators were assessed on the basis of various parameters. The results of this study have been summed up in [Table 2]. While evaluating the distance of the eye of the operator from the patient's oral cavity, it was found that of 75 individuals 15 were clinically compliant with the ergonomic principles. P = 0.965 which was found not to be statistically significant. Improper neck position can give rise to musculoskeletal problems such as spondylitis, spasm, etc., and result into neck pain. In this study, none of the operators had a correct position of the neck, thus being the most neglected parameter. Only three individuals were observed to follow the correct position of the elbow. Among 75, only 16 individuals had a properly positioned upper back and 25 for the lower back. This indicates that the majority of the individuals fail to position their back in the correct manner while performing clinical work. The P values for both of these parameters were 0.530 and 0.098, respectively, which were not significant. While evaluating the position of the thigh, it was found that only 15 individuals were following the correct thigh position while operating and higher rates of operators were recalcitrant to the ergonomic principles, and the P = 0.717 which was not statistically significant. Good illumination and visibility are guarded by proper position and appropriate distance of the light from the oral cavity. Proper accessibility and visibility, in turn, improve working efficiency and productivity. When evaluated for the distance of the headlight from the oral cavity, only 20 practitioners had positioned the light at a proper distance while performing dental procedures. P = was 0.808 which was not found to be statistically significant. Work-related musculoskeletal disorders can be prevented by maintenance of balanced posture. Proper application of ergonomics in dentistry assures high productivity of the operator, prevents illnesses and injuries, and increases the efficiency. Deviation from balanced posture may result in pain incited by musculoskeletal disorders. In addition, reduction in productivity and psychological problems can be prevented. These problems are arising because the professionals remain seated for hours performing repetitive movements forcing muscular and joint structures. In this study, it was found that the least accurately positioned parameter was neck (97.33%) which is similar to the results of the study conducted by Garbin et al. (89%). Harutunian et al. too noticed that the neck is incorrectly positioned by most of the operators (58%). The neck is most commonly affected due to poorly designed workstations. It may be observed that due to improper vision or access to the patient's oral cavity, the operator may tend to bend into awkward positions to have a better view of the operating field which may result into deviation from the balanced posture. A significant relation was found when relating students' neck and back pain after clinical work. Incorrect neck position may radiate an incorrect back position thereby causing backache whose prevalence is quite high in dentists (76%). Following the upper back, the lower back is one such parameter which could be maintained by 33.3% of the total population. This is further exaggerated by not following parallelism of the thigh to the floor. As mentioned by Garbin et al., in his study, only 34.7% of students correctly positioned their legs and about 30% of students incorrectly positioned their feet on pedal drive. This deviation could be because of the failure of dental professionals to maintain a comfortable stool position leading to upper back issues. Disc pressure increases rapidly when sitting in forwardly bent and rotated positions. This is most commonly seen the position in dental professionals. In this study, only 4% of dental practitioners correctly adapted the elbow position, and 89% of them failed to do so. In contradiction to the result obtained by Khan et al. in his study, only 13% of dental practitioners correctly positioned their elbows while operating. This could be due to the incorrect chair position and operating stool height leading to incorrect elbow postures. Among the total number of dental professionals who were assessed during this study, only 26.6% maintained appropriate distance of the headlight from the oral cavity and 54.6% failed to maintain the appropriate distance while 18.6% professionals could not be assessed. A similar result was observed in Khan et al. study. This could be due to constant repositioning of the patient while operating which may, in turn, require constant repositioning of the headlight which can be cumbersome and tiring. Parallel positioning of the light beam in the observational direction provides shadow-free lighting, improving the quality of the work. Not performing any exercise or indulging in any sport on daily basis increases the risk of having musculoskeletal problems. Inappropriate workplace ergonomics also affects efficiency and job satisfaction. Improved health among Indian dentists would directly improve the overall dental health of our country in a due course of time. There are a few limitations in this study. During data collection, all the photographs were clicked from a single angle, thereby constricting the vista for evaluation all parameters. In some cases, certain parameters could not be assessed due to this reason. The photo analysis and measurements were done manually which could have lead to bias. The sample size was constricted to 75 as the willingness to participate in a photograph-based study was quite low among the dental operators. It is recommended that proper ergonomics should be inculcated in instrument designing, planning of workstations, and should be implemented while performing clinical work. To curb the work-related musculoskeletal disorders, certain measures can be taken. First and foremost, ergonomic problems in the operatory should be corrected. Awareness among young and old dental practitioners should be created through CDE programs, lectures, and programs. Yoga, meditation, and other exercises should be regularly performed to reduce stress levels and release the muscular tension. Chairside stretching should be performed at regular intervals to prevent microtrauma and muscle imbalances. The use of dental loupes and microscope facilitates a more upright posture and diminishes or eliminates chronic back and neck pain. Musculoskeletal problems among dental professionals are on a rise. This leads to deterioration of the quality of work delivered by the dentist, thus leading to a compromised treatment. It is one of the reasons for early retirement of dental practitioners. Proper implementation of ergonomics and maintenance of balanced posture can prevent the occurrence of such disorders and bless the dentist with a prolonged working tenure. Pîrvu C, Pătraşcu I, Pîrvu D, Ionescu C. The dentist's operating posture-ergonomic aspects. J Med Life 2014;7:177-82. Garbin AJ, Garbin CA, Diniz DG, Yarid SD. Dental students' knowledge of ergonomic postural requirements and their application during clinical care. Eur J Dent Educ 2011;15:31-5. Harutunian K, Gargallo-Albiol J, Figueiredo R, Gay-Escoda C. Ergonomics and musculoskeletal pain among postgraduate students and faculty members of the school of dentistry of the university of Barcelona (Spain). A cross-sectional study. Med Oral Patol Oral Cir Bucal 2011;16:e425-9. Khan SA, Chew KY. Effect of working characteristics and taught ergonomics on the prevalence of musculoskeletal disorders amongst dental students. BMC Musculoskelet Disord 2013;14:118. Kalghatgi S, Prasad KV, Chhabra KG, Deolia S, Chhabra C. Insights into ergonomics among dental professionals of a dental institute and private practitioners in Hubli-Dharwad twin cities, India. Saf Health Work 2014;5:181-5. Gupta A, Bhat M, Mohammed T, Bansal N, Gupta G. Ergonomics in dentistry. Int J Clin Pediatr Dent 2014;7:30-4. Liebregts J, Sonne M, Potvin JR. Photograph-based ergonomic evaluations using the Rapid Office Strain Assessment (ROSA). Appl Ergon 2016;52:317-24. Gupta A, Ankola AV, Hebbal M. Dental ergonomics to combat musculoskeletal disorders: A review. Int J Occup Saf Ergon 2013;19:561-71. Garcia PP, Gottardello AC, Wajngarten D, Presoto CD, Campos JA. Ergonomics in dentistry: Experiences of the practice by dental students. Eur J Dent Educ 2017;21:175-9. Gupta S. Ergonomic applications to dental practice. Indian J Dent Res 2011;22:816-22. Sasso Garcia PP, de Araujo Gottardello AC, Presto CD, Bonini Campos JA. Ergonomics work posture in undergraduate dentistry students: Correlation between theory and practice. J Educ Ethics Dent 2015;5:47-50. Yousef MK, Al-Zain AO. Posture evaluation of dental students. JKAU Med Sci 2009;16:51-68. Siddiqui TM, Aisha W, Khan OH, Khan M, Zafar F. Assessment of knowledge, practice and work related to ergonomics among dental students and dental practitioners. Int J Contemp Dent Med Rev 2016; 2016:2. Petromilli Nordi Sasso Garcia P, Polli GS, Campos JA. Working postures of dental students: Ergonomic analysis using the Ovako Working Analysis System and rapid upper limb assessment. Med Lav 2013;104:440-7. Bhagwat S, Hegde S, Mandke L. Prevalence of musculoskeletal disorders among Indian dentists: A pilot survey with assessment by rapid entire body assessment. World J Dent 2015;6:39-44. Vijay S, Ide M. Musculoskeletal neck and back pain in undergraduate dental students at a UK dental school – A cross-sectional study. Br Dent J 2016;221:241-5. Varmazyar S, Amini M, Kiafer S. Ergonomics evaluation of work condition in Quazin dentists and its association with musculoskeletal disorders using REBA method. J Slam Dent Assoc Iran 2012;24:181-6. Diniz DG, Diniz JD. Current considerations in dental ergonomics: Standards and guidelines, teaching and prevention. J Ergon 2017;7:200. Chaiklieng S, Suggaravestsiri P. Ergonomics risk and neck shoulder pain among dental professionals. Procedia Manuf 2015;3:4900-5. Kumar VK, Kumar SP, Baliga MR. Prevalence of work-related musculoskeletal complaints among dentists in India: A national cross-sectional survey. Indian J Dent Res 2013;24:428-38.